I finally threaded the elastic in the waist of this easy peasy patchy skirt. It was a fun little project I made when I had the urge to sew and took no time at all. I'm not loving the border though... I'm thinking I might replace it with some a solid coloured binding or a piece of ric rac. What do you think? It's so cute! I like the border as is. I have a lot of sheets, I might try this idea out. Leave it! I love it! So so pretty! Were they previously vinatge bed sheets? Such a clever idea. It's so pretty just the way it is Lea!! Love it! So cute!! love the border! 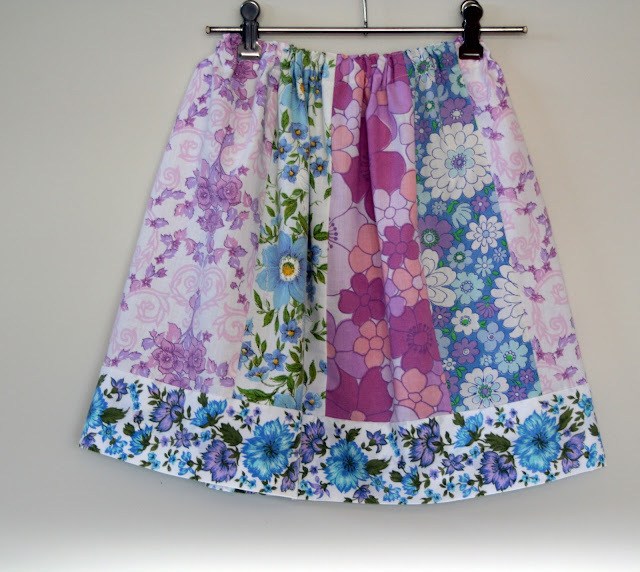 Oh this is so pretty, I love the colors and floral patterns on this skirt. I think I agree with everyone else, leave the border. No I love the border and that's my favourite vintage sheet!